Two years later, Democrat candidate for State Senate fined. He is running again. S.E.E.C. fines losing candidate 2016. Hartford Courant dates this story for Sunday, April 2??? And read above how she closed it, too. It's decision time in the long-running lawsuit over whether Democrats can be forced to hand state investigators Gov. Dannel P. Malloy's 2014 campaign emails — but lawyers for both sides have asked a judge to delay his ruling for two more weeks to permit one final attempt at settling the case. 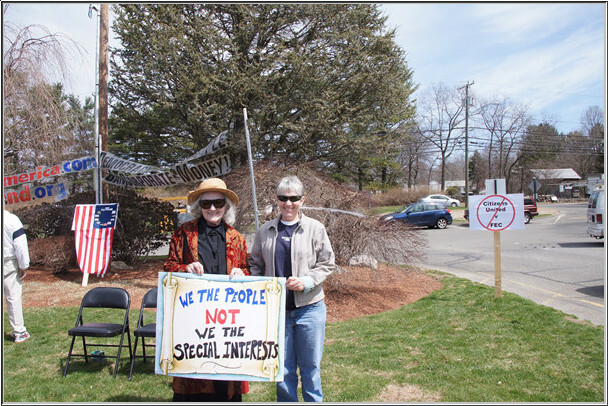 From Jon Lender at the Courant Nov. 21, 2015: "'...At a time when upwards of 90 percent of voters in both major parties say money in politics is a problem, Connecticut Democrats are going backwards toward corruption and the era of John Rowland,' said Karen Hobert-Flynn, senior vice president of the advocacy group Common Cause..."
Campaign finance is an issue that merges with F.O.I. 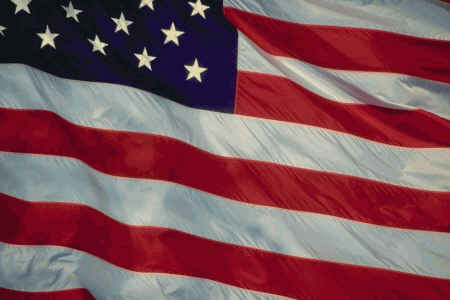 law - disclosure and timely disclosure can make a difference on elections, which in turn, affect political patronage. Mother and daughter in league together to protest recent Supreme Court ruling on campaign finance. All three who came spoke: Rep. Fawcett, Rep. Steinberg and Rep. Hwang (above - link added Feb. 27, 2015). 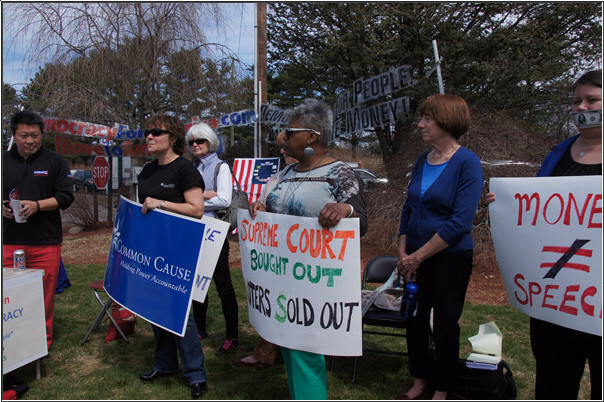 Serious stuff, as the partners in the coalition: Common Cause (Cheri Quickmire), CT League of Women Voters and Connecticut Citizen Action Group, CONNPERG, and others. Thank you organizers Common Cause and Fran! HARTFORD, Ct. (CN) - Connecticut's attorney general has taken his own party, the Democrats, to court to enforce a subpoena issued by election regulators. The enforcement action filed Wednesday stems from a 2014 complaint by the Republican Party with the state. Connecticut's State Elections Enforcement Commission had opened an investigation into the complaint, but Democratic State Central Committee attorney David Golub sent a letter on June 15, three days before that deadline, saying it would not answer the subpoena for documents. The Hartford Superior Court now faces a petition to enforce the subpoena after the commission voted to refer the matter to the Attorney General's Office for enforcement. "The SEEC unsuccessfully sought to obtain the voluntary cooperation of the DSCC in its request for information relevant to its investigation of the complaint," the enforcement action states. "Due to the DSCC's refusal to voluntarily comply with requests for information from the SEEC, on May 28, 2015, the Commission issued an investigatory subpoena." Money illustrationThe Senate Democratic majority is blocking House Speaker J. Brendan Sharkey, D-Hamden, and minority Republicans from closing a loophole in Connecticut’s system of publicly financing campaigns — the parties' ability to funnel unlimited special-interest money to taxpayer-supported candidates. A foundational element of the voluntary public financing program was a cap on spending and contributions, but Gov. Dannel P. Malloy and the Democratic majority neutered those caps in 2013 with revisions allowing unlimited coordinated expenditures on legislative races by the state parties. 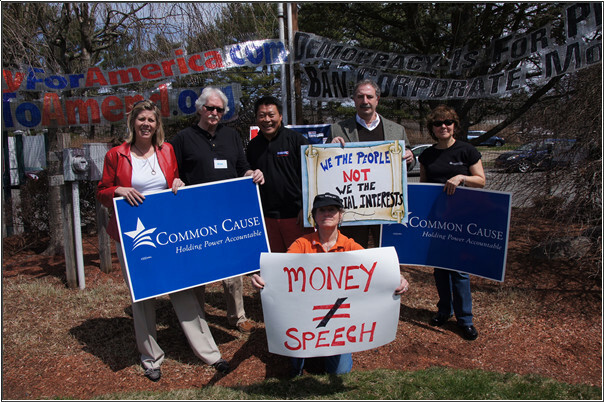 Taxpayers spent $33.4 million on publicly financed campaigns in 2014. With a committee deadline on campaign bills fast approaching, the Senate Democrats are standing fast, saying the parties must have the ability to pump unlimited funds into campaigns as a defense against independent expenditure groups. The State Elections Enforcement Commission dismissed a complaint against Northeast Utilities CEO Thomas May Tuesday, but not before offering some harsh criticism of the solicitation the state contractor sent last September to his employees. 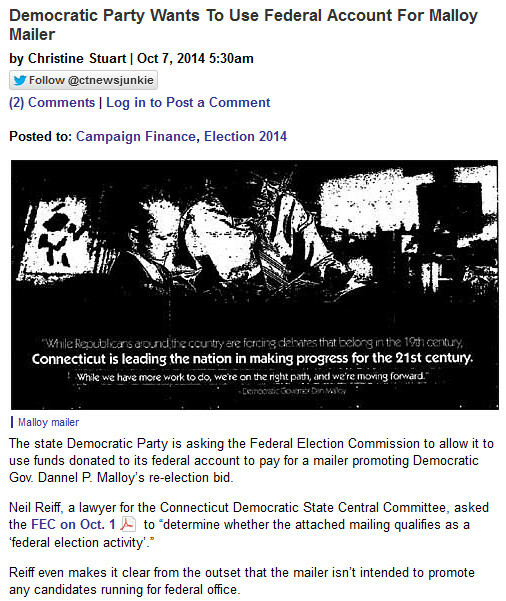 “The next gubernatorial election is upon us, and I am asking each of you to join me in financially supporting Connecticut’s Governor Dannel P. Malloy,” May wrote in his Sept. 27, 2013 email to company managers. 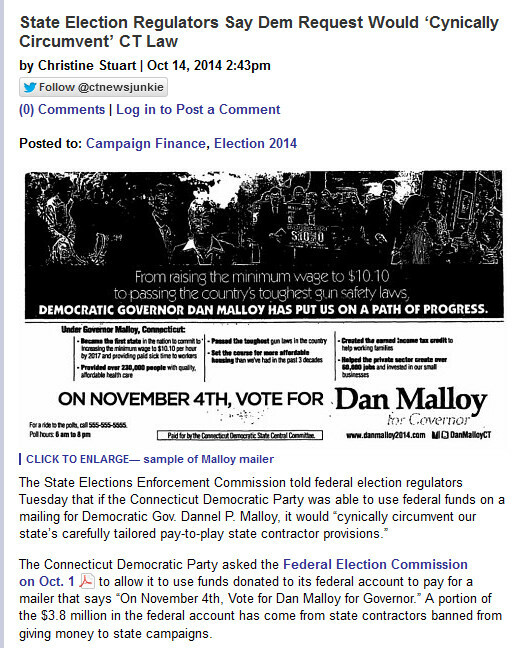 The email, which was sent from May’s gmail account, suggested that donations be made to the Connecticut Democratic State Central’s federal account. State election law prohibits state contractors from contributing to state party accounts or the campaigns of statewide candidates. “The Commission does conclude that the content of the solicitation by Mr. May is both offensive and disturbing and violates the spirit and intent of the Connecticut state contractor ban,” the 5-0 decision to dismiss the complaint reads. A federal judge's decision Tuesday leaves intact the state's regulatory authority over independent campaign expenditures by groups such as the Democratic Governors Association, but it does not block the DGA from supporting the re-election of Gov. Dannel P. Malloy. Chief U.S. District Judge Janet C. Hall denied the association’s request for an injunction blocking the enforcement of state campaign finance laws, concluding that its speculation of possible unconstitutional enforcement action gave it no legal standing to sue. In a 41-page decision, the judge offered sympathy regarding the difficulties of parsing evolving legal restrictions on campaign finance, but she made clear there is no evidence that the DGA is in imminent danger from the State Elections Enforcement Commission. At issue was the question of potential illegal coordination between the DGA, which is expected to spend millions of dollars to support the first-term Democratic governor’s re-election this fall, and Malloy, who has been raising money for the association in Connecticut and elsewhere. NEW HAVEN >> Newly minted Common Cause President Miles Rapoport said his organization will begin to focus largely on inequality issues to combat the widening income and wealth divide. Rapoport’s comments came during a Monday meeting with the New Haven Register editorial board. Common Cause, established in 1970, has 35 chapters from Connecticut to California. The progressive-leaning advocacy group has long defended voting rights, fought for campaign finance reform and government accountability. 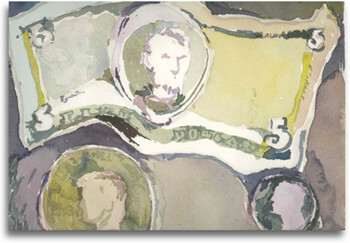 In the wake of the Supreme Court’s Citizens United ruling and the subsequent rise of Super PACs, the wealthy have been able to exert more influence on politics, Rapoport said. That excessive influence was part of what moved the nonprofit to engage in the economic disparity fight. “Do we want one-tenth of 1 percent (of the population) to be so dominant in politics?” he said.